‘GGG’ Heads to New York City This Weekend! LOS ANGELES, CA, June 2, 2015 — Boxing Superstar GENNADY “GGG” GOLOVKIN will travel to New York City this weekend to watch Miguel Cotto and Daniel Geale fight for the WBC middleweight title at the Barclays Center in Brooklyn, New York this Saturday night, June 6. Universally recognized as the best middleweight in the world, Golovkin is the mandatory challenger for the World Boxing Council’s Middleweight Title, which Cotto will be defending. With an extraordinary record of 33-0 with 30 knockouts, Golovkin has the highest KO% in middleweight history and has become one of the most marketable international stars in boxing. On May 16, Golovkin filled the legendary Forum in Los Angeles with over 12,000 fight fans as he stopped #2 ranked challenger Willie Monroe Jr. in the sixth round. In keeping with his outstanding international television ratings, the fight reached 1.5 million viewers on HBO in the United States and was shown in over 120 countries worldwide. “His two most recent US fights have sold over 21,000 tickets, making him the highest ticket seller in the State of California. This coupled with his continued growth in TV ratings, has made Gennady one of the sport’s most watched fighters,” said TOM LOEFFLER of K2 PROMOTIONS. His all-action style and dominance of his division has Golovkin ranked # 4 Pound For Pound by ESPN.com and Ring Magazine, riding a knockout streak of 20 KOs in a row. 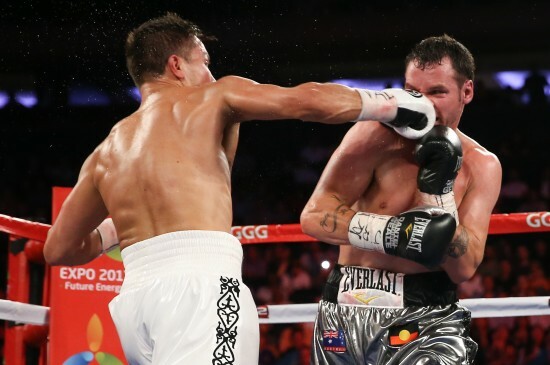 On July 26, 2014, Golovkin stopped Geale at Madison Square Garden with a stunning third round knockout featured on numerous “Knockout of the Year” year-end lists.